Christmas may be right around the corner, but Star Wars has already arrived! With all the hype and merchandise, kids are sure to be excited about this new space adventure out in theatres now. The new movie may be exciting, but Star Wars is a saga that has been around for nearly 40 years. Whether your child has already seen the older films and shows or whether they are looking to get into them now with all the holiday hype, KD Novelties has a fun and interactive way to help introduce kids to the early Star Wars stories. 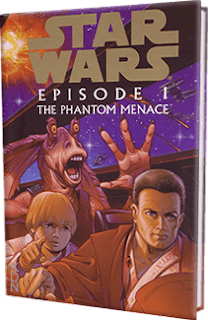 A long time ago, in a galaxy far, far away… plenty of adventures were had, and your child can take part by reading “Star Wars the Phantom Menace” and “Star Wars: Queen Amidala” personalized books. 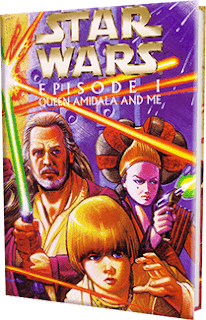 These rare copies sets kids on a unique adventure along with famous Jedi Qui-Gon Jin and Obi-Wan Kenobi as well as the Queen of Naboo, Queen Amidala, in two exciting stories. Sure, there is more than plenty when it comes to Star Wars related merchandise, but with personalized books, your child can embark on an interstellar adventure while also bolstering their reading interest and comprehension skills. Reading stories that are popular especially a brand that is currently in the public eye, is a great way to promote literacy in children and get reluctant readers reading again. Best of all when the stories are personalized they are immersed in the stories they love. With both of these Star Wars personalized books, you can help improve your child’s relationship with reading and learning while also sending your child on an exciting Star Wars adventure!